Donna and Sharbel's story is an extraordinary tale of two halves of one single soul finding each other in a sweet and transformative reunion of blessed friendship and eternal love. They were both members of “The Power of Our Way” online spiritual community created by Rev. Anita Pathik Law and her husband Brent Law. They had seen each other’s names, but had never spoken to one another. They found themselves in an online class together in September 2011, Anita’s Prayer Coaching class. Sharbel recalls that he wasn’t even supposed to take that class, but something happened and he decided to see if he could get in. Since he was seven hours ahead of everyone, he never participated in any of the calls, but listened to all the recordings. It was on those recordings that Sharbel first heard Donna’s voice. And something in her voice, before he even realized it, spoke to his soul. Her voice resonated so deeply for him and he paid careful attention to all she shared. On those calls, Donna often shared intimately from her heart. And Sharbel’s heart formed a sweet connection with Donna before he even ever spoke to her. When Anita became sick, she asked Donna to contact the students abroad and let them know that classes had been cancelled. So Donna emailed Sharbel, who was living in Beirut, Lebanon, to share Anita’s news. That first email led to their first Skype audio call. It also led to more calls and an ever-growing bond and friendship between the two. When Sharbel traveled to the United States to study for his advanced degree in Organizational Systems in January 2012, he promised Donna he would be in touch. It wasn’t until the day of his departure back to Lebanon, 11 days later, that he called her. And she wasn’t happy. It was on that call that Sharbel asked Donna to “ask the angels” what they thought in an effort to mend fences. 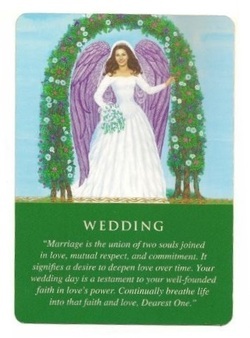 The first card that Donna pulled was the fateful "Wedding" card. Donna recalls Sharbel saying, “I like this card." They began Skyping more and more and then met on Skype video. On Valentine’s Day 2012, Sharbel sent Donna a dozen red roses and Donna appreciated his sweet gesture. He took off from work that day and spent much of it on Skype with Donna. 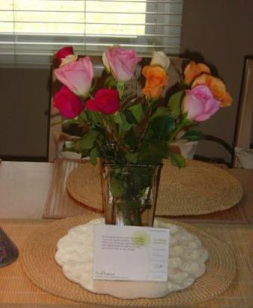 A friend told Donna that men never send roses unless there is some romantic connection, but Donna did not believe it was anything more than friendship at that time. The friendship grew deeper and feelings on both sides continued growing. But there were so many obstacles and differences between them that a romantic relationship didn’t seem possible. God’s hands were at work in this relationship and neither Sharbel nor Donna understood that each held the key to the other’s divine destiny. Sharbel became a dear and supportive friend not only to Donna, but to Donna’s mother, Ginger, who was very ill and in the last year of her life. Every time a serious medical decision had to be made, the three of them made it together. 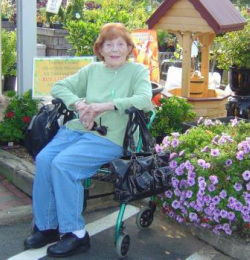 Ginger grew to love, value and appreciate Sharbel and asked him to come to New Jersey before it would be too late given the fragility of her health. Sharbel booked his first visit to coincide with Donna’s August birthday. Alas, it was a week after Ginger had died and Sharbel never got to meet Ginger in person. But he was able to comfort her the night before she died. On the phone, he told her she could go in peace because he would always take care of her daughter. And he was there to comfort Donna a week after the loss of her mother. Since that time, Sharbel visited Donna in New Jersey four more times. On the third time, Sharbel accompanied Donna to Ben Lomond, CA, where she was ordained an interfaith Angel Minister. It was there that Donna and Sharbel had a sacred Commitment Ceremony amidst the magnificence of the sequoias, surrounded by fellow angel ministers and others at the retreat. When Sharbel returned to Lebanon, he was wearing a wedding band on his right hand, the symbol of a man who is engaged. Donna transfered it to his left hand during their wedding ceremony. Sharbel also visited Donna in November 2013 and enjoyed his first Thanksgiving in the United States. Donna and Sharbel were reunited again in mid-May when Sharbel arrived to stay in the United States and begin his new life with Donna and their precious dog Harry, an English springer spaniel. 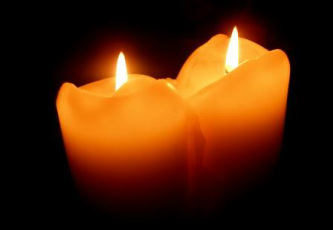 Several months into the friendship, Sharbel asked Donna, “Do you think we might be Twin Flames?” Donna didn’t understand what that was and said she didn’t know. When she looked it up, however, she was amazed. So much of what was shared was exactly what she and Sharbel had been experiencing. It became clear to both that they were indeed Twin Flames and that they shared a common soul and had known each other since their creation. Under the "More" tab above, click the "About Twin Flames" heading to read more about the characteristics of Twin Flame relationships. Their wedding theme was about the reunion of Twin Flames. Sharbel and Donna have come together to rescue and love one another and to serve God and others, fulfilling their divine destinies and life purpose. Copyright© 2014 Love Healing and Miracles. All rights reserved.